These are no ordinary veggie wraps. What makes them so special is the synergy between the ingredients. The veggie juices, with a strong hint of mushrooms and feta, melt into yogurt. The yogurt melts into hummus. And all this goodness fills a warm whole wheat wrap with savory deliciousness. Meat and fish have not been my best friends lately. It's very not like me, but pregnancy can do these things to people. I've been having terrible carb cravings and trying to find creative ways to satisfy them while eating healthy. Soups were great, but after 3 weeks, even I can get tired of them. That's when the veggie wraps came to the rescue. They have it all -- carbs from the wrap, protein from hummus, calcium from yogurt, feta, and spinach, and tons of fiber from all these veggies and legumes. In a large skillet set over med heat, cook onion and carrots in 2 Tbsp olive oil with a generous pinch of salt stirring occasionally, until slightly browned. Turn up heat to high and add mushrooms. Cook until all the vegetables are nicely brown about 5-8 minutes, stirring occasionally. Remove to a bowl and set aside. Add the remaining Tbsp oil to the same skillet and cook peppers with a pinch of salt on med-high heat, stirring occasionally until nicely browned. Add spinach to peppers and cook stirring until wilted. If all the spinach does not fit at once, add it in portions. As one portion wilts add the next portion until all the spinach is in the skillet. While the spinach is cooking, fold the wraps in half, wrap them in foil, and put in the oven for 5-7 minutes to warm up. Return onions, carrots, and mushrooms to the skillet and season all veggies to taste with salt and pepper. Turn down the heat to medium-low. Sprinkle feta over veggies (don't stir). Cover the skillet and cook until feta is mostly melted, about 3 minutes. Lay the wraps out on the clean surface. Spread 2 Tbsp of hummus on each wrap leaving about 3" border on all sides except for the one closest to you. Spread 2 Tbsp of yogurt on each wrap over hummus. Sprinkle with a pinch of salt. 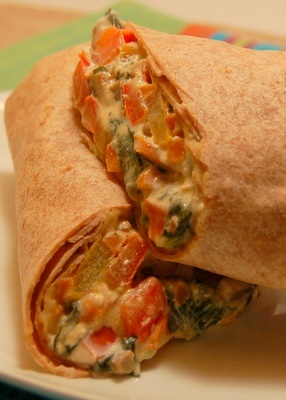 Divide the veggies equally among the wraps placing them on the part of wrap closest to you. Help yourself with a spoon to keep the veggies contained and fold the wrap away from you. Fold in the sides, and finish rolling the wrap away from you. Wrap a piece of foil around each veggie wrap, leaving one end exposed, so that only 3/4 of the veggie wrap is covered in foil. Put in the oven to warm up for 5 minutes (since wraps cool during the assembly process, they need this time to rewarm). Those sound really good, but I'm having a hard time visualizing the wrap-folding pattern. The reason you can see the filling in the picture of my wraps is that I cut the wrap in half. The reason I did that was so that you can see what's inside. I never do that normally since the wraps are much easier to eat whole. Thanks Helen, that was a lot of help. These look so satisfying! Yum! I've tried these. Very easy - and very, very good! Thanks. I look forward to the next idea!